Capoeira Moves, Capoeira Techniques and Tips for Learning! What are capoeira moves and capoeira techniques? These are unique movements which range from intense kicks to split second esquivas or escapes. All together they are essential to the fluid call and response of the game. There are a lot of them! With so many diverse moves, it can be overwhelming, especially to a beginner. I found one of the hardest parts was to memorize them all. I’ve found these capoeira moves can be managed by dividing them up into basic groups. The majority of moves can fall into the categories of basic movements, kicks, escapes, arm strikes and takedowns. I’ll go into a little more detail for each. 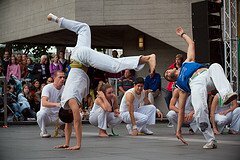 In the following links you’ll see some of the major capoeira techniques in each category. These lists will not be complete, but I’ll continue to update them as I learn and experience more. Basic Movements – These moves provide the foundation to playing capoeira. They are used to maneuver around the roda while playing capoeira. These include basic movements such as ginga and aú. Kicks – In capoeira, the most common attacks are kicks. These generally are offensive movements using a leg or legs to attack. There are a vast number of kicks varying in speed, position and use. Escapes – Just as important as attacks are the esquivas or escapes in capoeira. They are essential to avoiding another player’s attacks and also to getting into a position to set your own attack. Takedowns – As a beginner, it’s easy to be unaware of takedowns, I was. However, capoeira has a number of takedowns used to bring unsuspecting capoeiristas to the ground. These are to be used with care. Punches and Hand Strikes – Many people believe capoeira uses no punches or arm strikes. In reality there are a wide number of arm strikes ranging from simple slaps to elbow strikes. However, with the right motivation and focus, I eventually learned, and you will too! These tips are what I’ve used to learn moves and sequences quickly and effectively. Warm up – Before you attempt any capoeira moves, you should warm up. Stretching is especially a good way to warm up for movements you’re new to trying. This way you’ll have the range and flexibility you need to attempt the moves without hurting yourself. Train with a good teacher – This seems obvious, but with the amount of information out there, it’s easy to see movements without an instructor. However an instructor will have a lot of personal experience and know–how which will give you what you need to learn techniques. Practice – This tip is essential! It’s one thing to think you know how to do something. It’s another to have done it hundreds of times and know you can do it. I’ve learned from my mestre and experience that thinking doesn’t equal knowing. Pay attention – A lot of capoeira moves have subtle shifts in position or weight that are key to the success of the movement. I eventually learned meia-lua de compasso when I realized the pivot and hand placement I needed to make when performing it. That’s why it’s important to really pay attention while learning a move. Missing out on these differences can really slow your learn down or worse yet, hurt you from performing them wrong. Believe – While this tip isn’t as tangible as the others, it’s still extremely important. If you don’t believe you can ever perform a movement, you’ve already closed the door on ever learning it. Instead believe and know that you can learn any move you desire. This way you leave the door open for learning all that’s available in capoeira. I hope you can use these simple tips in your training to learn capoeira techniques quickly and safely. Good luck!